The brain is one of the most magnificent and complex things on earth. Even the brain is not perfect though. Sometimes, the immense amount of subconscious processes that constantly operate in your brain can result in some quirky glitches. In this month’s blog post, we will show you how you are tricked by your own subconsciousness. The Ponzo illusion. The two bold lines are the exact same length. Perhaps the most complex mechanism in your body is your ability to see. However, this also means that errors regularly appear in the process of seeing, although we might never actually notice. Did you know, for example, that when you see, the image displayed in your eyes is upside down? It is your brain that turns everything right-side-up, because it is much easier to navigate in a right-side-up world. If you were to wear a set of contact lenses that turns everything upside down, your brain would automatically turn it right-side-up again after a few days. In truth then, all you see is the result of your brain’s subconscious operation. Your brain constantly attempts to correct images so they look how the brain expects them to look. In fact, this is also how we perceive the world in three dimensions. The image that is displayed on your retina inside your eye is a two-dimensional one, but the brain sees depth and distance. 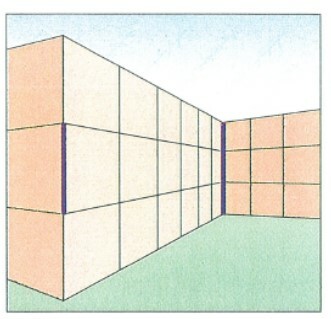 This is apparent in the Ponzo illusion above, where the distance cues provided by the wall tricks our brain to think that the line that is “further away” should be bigger. In the same way, your brain will also adjust colours, for example in accordance with shadows. In the Adelson illusion below, tile A and tile B are the exact same colour. Even when you know this fact, it is nearly impossible to see. No one knows exactly why, but the shadow of the cylinder and the pattern of the surrounding tiles tricks the brain into thinking that tile B must be another colour than tile A. The Adelson illusion. Tile A and Tile B are the exact same colour. Feel free to test it in a painting program! Sometimes, your brain’s subconscious alterations can result in quite a mess. Take a look at the café wall illusion below, named so after it was discovered by a scientist at a local café. 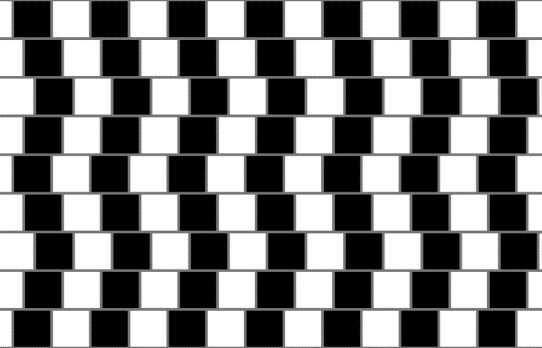 All the horizontal lines are parallel, but your brain is so busy trying to distinct the white squares from the black squares that the horizontal lines are skewed in the process. The café wall illusion. All the horizontal lines are parallel. Another subliminal process that eludes us all is the brain’s prioritization of importance. Whenever we use our senses, our brains will assess which part of the sensory impression is most important and guide our focus toward it. For example, try reading the following words. Now try saying the colours of the words. You will find that it is much harder to say the colours of the words as opposed to just reading them. This is because we do not usually have to pay attention to the colour of words. For that reason, our brains will instinctively rate the meaning of the word as more important than the colour of the word. When we then have to pay attention to the colour of the word, we have to bypass the brain’s prioritization, which is not such an easy thing to do. In order to understand how often this prioritization of sensory impressions affects us, we can take a look at the Kanisza triangle below. We can all clearly see a white triangle that has its tips inside the black circles, even though the triangle is not actually outlined. However, because our brain is used to seeing full shapes, what we see instinctively is an image of a white triangle on top of another triangle and three circles. Now try to convince yourself that the image is simply three Pacman-shapes and three V-shapes. This simple task is very difficult because our brains keep constructing the white triangle. The Kanisza triangle. We clearly see a white triangle although there is none. One of the most powerful tricks of the brain is expectation. Our expectations that a given action will have a specific outcome can actually fool our senses and our body entirely. When we are ill, fake pills administered under the guise of being a real drug can actually have a positive effect on our recovery because we expect it to – a phenomenon known as the placebo effect. However, our expectations also fool us on a more regular basis. In 2001, a wine aficionado and scientist by the name of Frédéric Brochet conducted a shrewd experiment in which he coloured a white wine red with fruit colour and then served it to 54 wine experts. The wine experts then spoke of it in terms that normally describes a red wine. In the same experiment, he served a Bordeaux in two different bottles. One had a plain label on it, while the other had a fancy grand cru label, but the wine was identical. The 54 wine experts proceeded to duly write off the plain-labelled wine as “weak” and “faulty” while the fancily-labelled wine was described as “complex” and “rounded”. Expectation has such a big influence on our senses that we can mistake white wine for red wine. Just imagine what other things we unknowingly allow our expectations to influence. It may seem surreal but the fact is that our brain plays tricks on us all the time. Whenever our senses are involved, our brain is too. When we see, our brain calculates and corrects and alters and prioritizes without us ever noticing. When we smell and feel and taste, our brain rigs the experience to fit our expectations. Ultimately however, it is absolutely crucial that our brain is able to trick us. Imagine having to navigate through an upside-down world, or being unable to assess distance or depth of something that isn’t right in front of you. For every tiny hiccup, there is a thousand reasons to be grateful for our brain’s astounding subliminal work rate. At Brain+, we encourage you to take good care of your magnificent brain. After all, it takes good care of you.